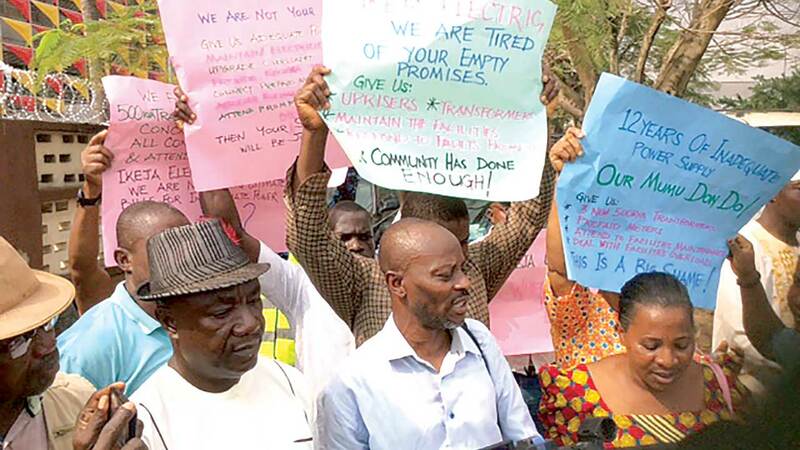 Residents of New London Estate in Baruwa, Ipaja, Lagos, at the weekend trooped to the corporate headquarters of Ikeja Electric to protest alleged poor treatment of the community by the electricity distribution company. The residents, who arrived in four Coastal buses, had many placards protesting several months of insipid power supply amidst outrageous bills. Speaking on their plight, New London Estate Community Development Association Chairman, Mr. Emmanuel Nzekwe, lamented that his community had written several letters to the company without any meaningful action on the matter. “In the past 12 years, we have been going back and forth with nothing meaningful coming to us right from the era of PHCN till now that Ikeja Electric took over. For how long are we going to remain in this suffering?” queried the CDA chairman, who was accompanied by other members of his executive, including the secretary, Mr. Biodun Adeniran. Brandishing a copy of the last petition the community wrote to Ikeja Electric’s managing director, Mr. Nzekwe wondered why a community of over 1,500 houses is often left in total darkness. “This is a copy of the last letter we wrote to Ikeja Electric’s MD when both Ipaja and Ponle sub-stations were playing hide and seek with us. Our first 500 KVA transformer was donated by Hon. Bisi Yusuf, Lagos State House of Assembly member representing our constituency. It quickly got overloaded; before then PHCN brought another smaller 300KVA to support it. The CDA Chairman regretted that since the installation of that New London 3 transformer, Ikeja Electric staff had been playing games over the redistribution of houses using the two legs raised so far. The protest was supported by an advocacy group, Coalition for Affordable and Regular Electricity (CARE).